Communication modes and available inputs / outputs. 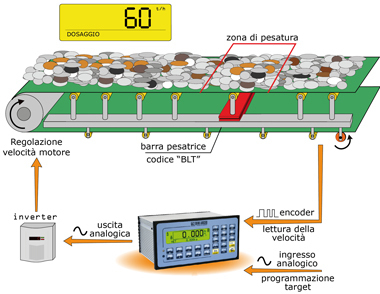 Software version for the measurement/integration of the weight, flow of material transitioning on the weighing belt, with memorisation of the quantity of dosed material; possibility of adjusting the flow through the 16 bit analogue output and PID control. Possibility of remote management of the instrument, through Sysway or Modbus RTU protocols, or Profibus through external optional interface. - Instantaneous reading of the flow, in kg/h or t/h with displaying of the status of the system and of the dosed total. - Adjustment of the dosage hourly flow, in function of the pre-setted target, with PID algorithm. Calibration of the flow reading function, for controlling the dosage performances. Programmable start dosage delay, for synchronisation of various E-BELT systems in the dosage of material mixtures. 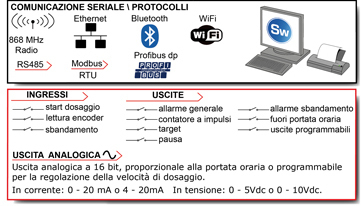 Management of the automatic dosage from remote master or through Profibus DP or Modbus RTU protocol.